Gun Safe Storage Solutions: How to Organize a Gun Safe? How to Keep Moisture Out of Your Gun Safe? What is the Best Way to Store Guns Without a Safe? How to Clean Your Welding Helmet in Less Than 10 Minutes? How to Adjust Your Auto Darkening Welding Helmet? How to Discreetly Hide a Gun Safe in Your House? #1.1 How to Hide a Gun Safe in Plain Sight? #1.1.1 Benefits of Hiding a Gun Safe in Plain Sight. #1.1.2 What to Consider Hiding a Safe in Plain Sight? #1.2 How to Hide a Gun Safe in Your Garage? #1.3 How to Hide a Safe in a Closet? 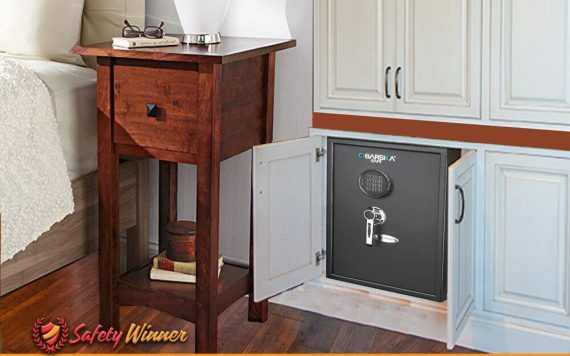 Gun safe can be the ideal way to protect the things that matter to you most. If you are a person who has firearms, jewelry, or other valuable items, you want to have the security to know that you have a place to store those items where people will not be able to take them. A safe gives you that kind of peace of mind. While this unit gives you that added protection, you also want to make sure that you are placing it in a location that ensures that either people will not know that it even exists or, if they do, that they are unable to get into it or remove it. This is one of the most essential aspects of owning a gun safe, and is often forgotten by many safe owners. They believe that the purchase is all that matters, but the truth is that security of your valuables is doubled or even tripled by taking the proper precautions when installing your safe this is why you want to be smart about where you choose as a location and how you install the safe itself. #1 How to Hide a Gun Safe in Plain Sight? If you ask most people, they will tell you that the smartest thing you can do is to store your gun safe in a location where it would be difficult to find. That would seem to make a lot of sense, but it is not always the practical choice. The truth is that gun safe can be a very decorative feature to your home. Many choose a gun cabinet where glass is used to display the weapons, but if you are trying to ensure that you are protecting your firearms then it is better that you choose an all metal safe, these can still look quite attractive, and many are beautifully designed and finished to give a very elegant look. The advantage of having it in a location that is open is that it makes it more easily accessible to you. Should you have an emergency, you don’t need to try to run to a closet or to the basement to locate your safe, get it open, and confront an intruder or other issue. If you are choosing a larger sized gun safe, one that is intended for use with long rifles, you can be sure that it can be quite heavy. Many of these safes way as much as 300 pounds, so someone is not likely to be moving that without the assistance of others or some form of mechanical equipment. That’s to your advantage right off. You can camouflage your gun safe so that no one would know you have it. You can purchase a cabinet where the safe would easily slide into it. In fact, there are safes out there that actually come pre-installed inside a cabinet, giving a form of camouflage that you can use to prevent people from knowing that you have a safe at all. There are cabinets that look like a normal china hutch, but have a sliding back where your rifles are stored. Unless someone new how the cabinet was designed, they would be completely oblivious to the fact that there were weapons stored inside the cabinet. There are gun safes you can purchase that look like small end tables or cabinets. A false front hides the locking mechanism, making it appear that it is nothing more than a simple and table are cabinet. However, if none of those options are available to you then consider some other form of camouflage. You could cover the safe with a cloth, making it appear as nothing more than a cabinet or table. You could even place a box over the top of it to make it appear as if it is something you are intending to move or something you are simply storing. Also, don’t be afraid to show off your gun safe if necessary. As long as you have properly secured the safe so that it is extremely difficult to remove, you have taken the proper precautions so that your safe can be out in the open. This makes it a lot easier for you to be able to get access to in an emergency, and lets people know that if they try to break into your home you been business! #2 How to Hide a Gun Safe in Your Garage? Your garage is actually one of the best places that you could hide a safe. This is especially true if you have some form of a workbench, even if it is the area where you reload your ammunition. It is likely that under the workbench you have boxes, cabinets, and toolboxes, all items you can use to hide your safe inside the garage. By cleverly placing these items around the boxes, you can camouflage your safe so that it would not be noticeable to anyone who didn’t know it was there. Because this is not inside your home, it is more likely that someone may attempt to take your gun safe because, to them, it is much more accessible than trying to get inside your home. Especially considering that people don’t spend a significant amount of time in their garage. Your gun safe needs to be mounted to a secure part of your garage that would be an incredible amount of work for someone to try to remove the safe. This can mean that you have it secured to the floor of your garage, that it is fastened tightly to a foundational beam, or maybe you have actually installed it inside your workbench area. You should not be discouraged from using your garage, however. Some find this to be a much safer option, because it removes the likelihood of a small child finding it, especially if they are aware that they are not allowed to play around mommy or daddy’s work area. Just make sure you have taken the proper precautions to ensure that a person is not able to remove your safe. #3 How to Hide a Safe in a Closet? If you are a person who doesn’t want to leave your safe out of the open, a closet is a fantastic place. A closet presents one of the best options available to you primarily because there are so many places that you could hide safe within your closet space. Plus, there are many closet options within your home. If you have a smaller sized gun safe, like maybe one specifically designed for a handgun, this can easily fit on a shelf, on the floor behind some shoes, or even inside another box. Once again, unless someone was aware that it was located year, it would be difficult to find. Gun safes designed for small hand guns mean that a person could easily take it if they were to find it. Placing it inside another box or storage container that would make it look like it was nothing more than towels, old newspaper articles, or something similar can really help to reduce the risk of someone finding the safe and taking it. Make sure that you are able to securely fasten the gun safe in place. While the safe may be heavy, that does not mean it is impossible to take. Thus, being able to securely fasten it to the floor or to structural beams will make it more secure. Before deciding to put your gun safe in the closet is how accessible it will be to you should an emergency arise. The last thing you need is to be trying to fumble to get to your safe should a person break into your home. If you have to try to quickly enter a combination lock while down on your hands and knees in a dark closet you may find that to be a difficult task. Choosing a location where it would be easy to enter your code or combination is important. This may even make it so that you choose a safe that is easier for you to open, such as one of the biometric fingerprint scanning options. Many people hang up coats, dresses, and other long garments in a closet, especially in their own bedroom closet or in the entryway to their home. This is a fantastic place to position your gun safe because it can easily be disguised behind garments, making it camouflage to anyone who wasn’t aware that it was located inside the closet. Levis has been a blogger for many years, and has a considerable amount of experience as an internet marketing executive. The idea behind the site was actually his brainchild. He had spent years using his skills as a marketing executive to help market and promote products and services and wanted to do something that really had an impact on consumers. He built a small team to help him get the site off the ground and to help develop the strategy behind what Safety Winner is all about. SafetyWinner is a participant in the Amazon Services LLC Associates Program, an affiliate advertising program designed to provide a means for sites to earn advertising fees by advertising and linking to Amazon.com. Amazon and the Amazon logo are trademarks of Amazon.com, Inc. or its affiliates. 11 Best Gun Safe Accessories That Can Lift You Up!